Welcome to Pioneer Acres! Inside our split rail fence theres an atmosphere of tranquility that takes you back to the days when lifes pace was a little less rushed - an ideal setting for a relaxing, carefree vacation. Your hosts, Paul and Kay Wilson offer four housekeeping cottages, each unique in its own way. They are situated among several acres of hardwoods, evergreens and meadows, well separated from each other to provide total privacy. Wireless internet. 2019 Rates:$125-$250 daily; $795-$1595 weekly. 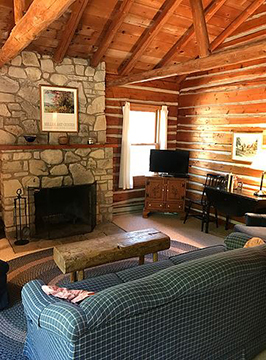 Each cottage has a distinct personality, from the cozy one bedroom units, to the spacious log cabins with their vaulted ceilings. Stone fireplaces, log and wood panelled interiors and antique furnishings combine with air-conditioning, electric heat, modern bath and kitchen facilities to provide you with rustic comfort. Pioneeer Acres is located just three "country blocks" from the bay and the center of the Village of Ephraim on a quiet country road. Enjoy hiking or biking on picturesque back roads or browse through the distinctive shops and art galleries in the village. Be it passive observance of nature or active participation in recreational activities, the opportunities are as limitless as your imagination. 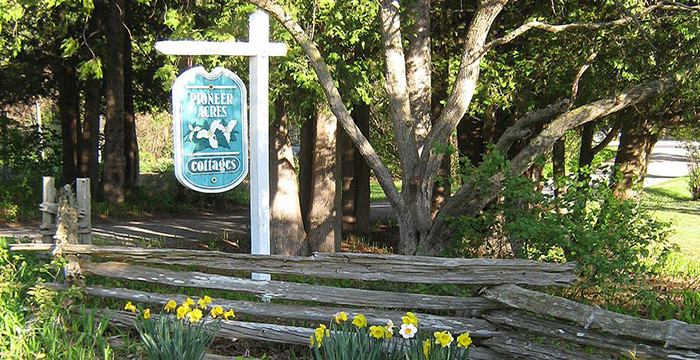 We invite you to consider Pioneer Acres in your vacations plans. ’Eagle’ - 1350 sq. ft. Log cabin with three bedrooms on upstairs level, two with twin beds, one with a queen bed, one bath up and half bath down. Fully equipped kitchen, dining room and living room both with fireplaces. Log exterior and interior, vaulted ceilings and hardwood floors. Hide-a-bed in living room. ’Partridge - 825 sq. ft. (incl. 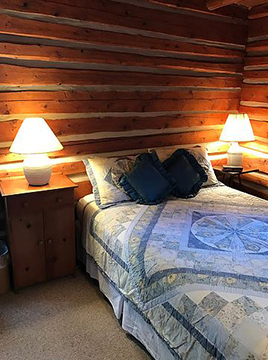 screened porch) Log cabin with two bedrooms, one with a queen bed and one with twin beds, fully equipped kitchen and dining area. Living room with fireplace, vaulted ceiling and full bath. Fully carpeted with hide-a-bed in living room. ’Phoebe’ - 675 sq. ft. (plus patio) One bedroom with queen bed, full bath, galley kitchen and dining area. Living room has fireplace and hide-a-bed. ’Wren’ - 675 sq. ft. (incl. screened porch) One bedroom with queen bed, full bath, galley kitchen and dining area. Living room has fireplace and hide-a-bed. 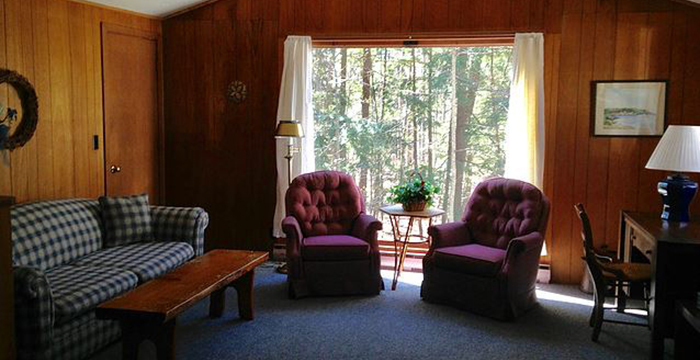 All cottages have air-conditioning, electric heat, cable TV, Weber grills and outdoor furniture. Weekly rentals requested for the summer season. Shorter stays may be available. 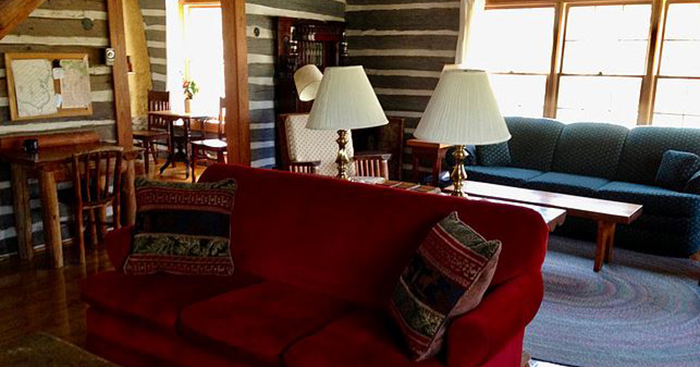 Please inquire.Each unit can accommodate 2 extra persons on a sleeper sofa at a rate of $7 per day or $40 per week.